Thomas Christopher Collins (born 16 January 1947) is a Canadian cardinal of the Catholic Church. He is the tenth and current Archbishop of Toronto, having previously served as Bishop of Saint Paul in Alberta (1997–1999) and Archbishop of Edmonton (1999–2006). On 6 January 2012, Pope Benedict XVI appointed him a cardinal at the 18 February 2012 consistory. Collins was born in Guelph, Ontario, the son of the circulation manager of The Guelph Mercury and a legal secretary; he has two older sisters. As a child, he attended and was an altar server at the Church of Our Lady. He attended Bishop Macdonell High School, where he was inspired by one of his English teachers to join the priesthood. Earning a Bachelor of Arts degree in English from St. Jerome College, Waterloo in 1969, Collins was ordained to the diaconate on 14 May 1972. In 1973, he received a Master of Arts in English from the University of Western Ontario and a Bachelor of Theology from St. Peter's Seminary, London. Collins was ordained a priest for the Diocese of Hamilton, ON by Bishop Paul Reding on 5 May 1973. He then served as associate pastor at Holy Rosary Parish in Burlington and at Christ the King Cathedral, as well as teacher and chaplain at Cathedral Boys' High School. He furthered his studies in Rome at the Pontifical Biblical Institute, from which he obtained a Licentiate in Sacred Scripture in 1978. Upon his return to Ontario in 1978, Collins served as a lecturer in English at King's College and in Scripture at St. Peter's Seminary, where he later became spiritual director (1981) and associate professor of Scripture (1985). Returning to Rome, he completed a Doctorate in Sacred Theology from the Pontifical Gregorian University in 1986. His doctoral dissertation was entitled: "Apocalypse 22:6–21 as the Focal Point of Moral Teaching and Exhortation in the Apocalypse." After becoming associate editor of Discover the Bible in 1989, Collins returned to St. Peter's Seminary as Dean of Theology and vice-rector in 1992. He later served as rector of St. Peter's from 1995 to 1997. On 25 March 1997, Collins was appointed Coadjutor Bishop of Saint Paul in Alberta by Pope John Paul II. He received his episcopal consecration on the following 14 May from Bishop Anthony Tonnos, with Bishops Raymond Roy and John Sherlock serving as co-consecrators, at the Cathedral of Christ the King in Hamilton, Ontario. He selected as his episcopal motto: "Deum Adora", meaning, "Worship God" (Revelation 22:9). Collins succeeded Bishop Roy as the fifth Bishop of Saint Paul in Alberta upon the latter's retirement on 30 June 1997. He became a member of the National Commission of Theology in Canadian Conference of Catholic Bishops (CCCB) that same year. He was promoted to Coadjutor Archbishop of Edmonton on 18 February 1999, and later succeeded Archbishop Joseph MacNeil as the sixth Archbishop of Edmonton on the following 7 June. Within the CCCB, he served as Chairman of the National Commission of Theology (1999–2001), member of the Permanent Council[permanent dead link] (1999–2003), and Chairman of the National Commission on Christian Unity (2001–2003). He was also a member of the organizing committee for World Youth Day 2002, which was held in Toronto. From 1999 to 2007, he was President of the Alberta Conference of Catholic Bishops. In addition to his duties as ordinary of the Edmonton Archdiocese, he was Apostolic Administrator of Saint Paul in Alberta from 16 March to 8 September 2001. After serving in Edmonton for nearly eight years, Collins was named the tenth Archbishop of Toronto by Pope Benedict XVI on 16 December 2006. He succeeded Aloysius Ambrozic, and was formally installed at St. Michael's Cathedral on 30 January 2007. He is heavily involved in the pro-life movement. Archbishop Collins is a member of the Pontifical Council for Social Communications since his appointment by Pope Benedict XVI on 5 January 2010. Collins was the apostolic visitor to the Archdiocese of Cashel in Ireland following the publication of the Ryan and Murphy Reports in 2009. He was part of a team that included Cormac Murphy-O'Connor, Cardinal Archbishop Emeritus of Westminster, who inspected Cardinal Brady's Archdiocese of Armagh, Sean O'Malley of Boston, who inspected the Archdiocese of Dublin, and Ottawa's Archbishop Terrence Prendergast, who looked at the west of Ireland (Archdiocese of Tuam), while Archbishop of New York Timothy Dolan was apostolic visitor to the Irish seminaries. On 18 February 2012, he was created Cardinal-Priest of San Patrizio. He will retain voting rights in a potential conclave until his 80th birthday. 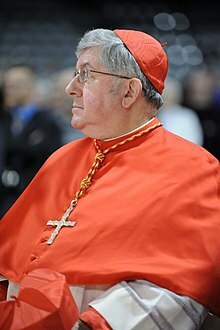 In addition to his other duties in the Roman Curia, Cardinal Collins was appointed a member of the Congregation for Catholic Education. ^ a b c d e f g h i j k l m "His Grace, Archbishop Thomas Collins". Roman Catholic Archdiocese of Toronto. ^ a b c d e f g "Archbishop Thomas Christopher Collins". Catholic-Hierarchy.org. ^ a b c "Archbishop Thomas Christopher Collins". Archives of the Roman Catholic Archdiocese of Toronto. "Collins Card. Thomas Christopher". Holy See Press Office. Archived from the original on 15 October 2017. Retrieved 6 December 2017.